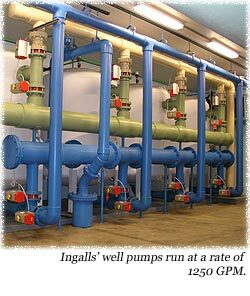 Ingalls is the third municipal water treatment plant for which an ozone system was designed and supplied by CleanWater Ozone. The town water is supplied by wells, pumping at a rate of 1250 GPM. Iron levels ranged between 2.5 and 3.5 ppm; manganese was 0.05 ppm; iron bacteria was also present in the water. High chlorine injection was unable to oxidize the iron and manganese. 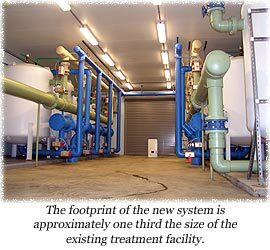 The CleanWater Ozone system was equivalent in cost to an aeration/detention system. 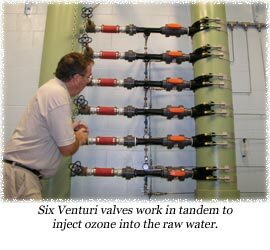 A pilot study had been conducted over a period of 12 months prior to installation to demonstrate to the Indiana Department of Environmental Management (IDEM) that our ozone system would operate efficiently using filtration at the rate of 10 GPM per sq. ft.; based on the success of this study, IDEM granted CleanWater a variance to its 10-state standard of 3 GPM per sq. ft. Click here to view the results of the 12-month pilot study. This represents a substantial cost saving to our municipal clients. The ozone system has been operating successfully at Ingalls since its installation. The iron content in the wet well varies from 0 to 0.05 ppm; the removal of organics and bacteria leaves the water crystal clear, with the taste and appearance of bottled water. Click here to read the plant operator's response.